This is an excellent introduction to a transport topic that has not been specifically addressed before, and is highly recommended. 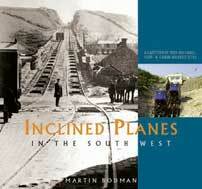 In the upland country which characterises much of the south west, inclined planes provided an essential means of transport for industry. Mines, quarries and limekilns all utilised cable-, rope- or chain-hauled planes in the period 1780-1950. Canals, too, as well as early railways, adopted them as an engineering solution. Gauges were broad, standard and narrow and rails were plateway as well as edge. Many of these linear landscape features remain. Some are becoming lost – reclaimed by nature; washed away, flooded or overgrown. Others can be explored. A few, such as cliff railways at coastal resorts, are still in use. This is the first publication to focus exclusively on these sites; over 200 in Bristol, Dorset, Somerset, Devon and Cornwall appear in the gazetteer. It is copiously illustrated with contemporary and modern photographs plus 58 maps, many of which have been specially drawn.